Kodi boxes (otherwise known as Android TV boxes) are a massive success no matter how you slice them. The best models deliver 4K video to your TV and allow you unfettered access to audio and video streams of every format and service. If there's a better, more versatile piece of AV software out there, we've yet to see it. The only real drawback we can think of is that Kodi doesn’t actually manufacture streaming boxes (no, the official Kodi Raspberry Pi case doesn't count), so you need to find your own device to run it on. That said, while there are plenty of boxes available with Kodi pre-installed, you have to be careful. So-called 'fully loaded' Kodi boxes come with lots of add-ons that give you access to pirated content. Unsurprisingly, there's a huge crackdown on these types of boxes, with the EU declaring them illegal. The best solution is to find a compatible media box and manually install Kodi. And with this guide, we’ve gathered together the best Kodi streaming boxes on the market in 2018. For each, we've tested how easy it is to install Kodi, how smoothly it runs, and how each handles playing 1080p or 4K video. Well, this is a surprise. The Xbox One X is the best Kodi player of the year. Sporting Kodi 18 Leia, installing the media streaming suite is impossibly easy on Xbox One X - just head to the App Store to grab the latest version. That makes it way easier than side-loading the software on Amazon devices and, thanks to the processor and copious memory inside the Xbox One X, it runs like a dream. The only thing holding the Xbox One X (and, to a lesser extent, the Xbox One S) back from utter perfection is that some add-ons haven't been optimized for Kodi 18 yet - and, with no other options in the store, you're forced to leave some add-ons behind. Still, if you don't mind missing out on a few add-ons, the Xbox One X is our top pick for the best Kodi box this year. The Nvidia Shield is the most powerful Android set-top box that we've reviewed. It's designed with all types of 4K home entertainment in mind, from Netflix to the latest games via Geforce Now. Unsurprisingly, this power makes the Nvidia Shield one of the best boxes for Kodi. Running Android TV on Android 6.0, the Nvidia Shield is one of the easiest boxes to configure Kodi on. With Google Play reconfigured for your TV screen and remote control, rather than a touchscreen, installing Kodi was an absolute breeze; in fact, we didn't have to type anything, since we were able to use the voice search provided by the remote control to find the Kodi app. We tested 4K and 1080p videos, with both streaming smoothly. The Shield could also easily downsample 4K video to fill a 1080p TV, too. We had no problems using the built-in 802.11ac Wi-Fi; if your network signal isn't strong enough, there's an Ethernet port in the back. Considering the small size of the Nvidia Shield, the performance is phenomenal. If you don't care about the gaming content, the Amazon Fire TV is better value for 4K playback; if you want the absolute best performance, this is the media streamer to buy. Putting Kodi on the Amazon Fire TV takes a bit of finagling, yes, but when it's on there the world of streaming video will be your oyster. We prefer the latest iteration of Amazon's streaming device because it delivers 4K HDR video via a small, inconspicuous dongle. It's easy to hide out of sight and does nothing to mar the appearance of a perfectly clean entertainment center. In terms of specs, the Amazon Fire TV has a Quad core ARM Cortex-A53 CPU with speeds up to 1.5GHz. It uses the Amlogic S905Z SoC architecture and supports 32-bit apps. Inside you've got 2GB of RAM and 8GB of storage. Its Wi-Fi antenna supports 802.11 a/b/g/n/ac; 2x2 MIMO (2.4 GHz and 5.0 GHz dual band) which means it can handle 4K streams without a problem. Our only problem with the Amazon Fire TV is that the remote isn't the best. It's made from a plastic material and, due to its small stature, can be easily lost. Minor qualms aside, however, this is probably the best Kodi box on the market right now. The Amazon Fire TV Stick is one of the most popular streaming devices among Kodi users – and it has been for a while. With the 2017 version of the Fire TV Stick, things are even better. A faster processor makes the media streamer 30% faster than the old one, according to Amazon. The new stick also features Alexa support built in (although this doesn't work with Kodi), and the device is only slightly more expensive than the original. The included Bluetooth remote control effortlessly navigates through Kodi’s menus and interface. While the older Fire TV struggled a little to navigate Kodi's menus smoothly, the new model has no such trouble with the default skin. If you don't care about not having 4K and want a small, simple device that can handle 1080p Kodi, as well as Netflix and Amazon Prime Instant Video, this is the best Kodi streaming box for you. Kodi runs beautifully smoothly on the Fire TV and takes just a few seconds to load. Amazon's excellent Voice Remote is great for navigation and connects via Bluetooth, so you don't need line of sight; voice commands are not supported in Kodi, though. We tested using 1080p and 4K videos, with both playing smoothly. The Fire TV has 802.11ac Wi-Fi built in, but if your home network isn't fast enough to play video without buffering, there's an Ethernet port, too. While streaming is the easiest option, the Fire TV has a microSD card slot so that you can load this up with movies. Given the media player's small dimensions, you can load it up with content for travelling. Want 4K, but don't want to pay over the top for a box that can handle it? You need the Android-powered Seguro Trongle X4. There's always a slight fear that bargain-basement products have severe limitations, but the Trongle X4 is refreshingly good, with only the minor annoyance. Measuring just 110mm square with a height of 17mm, the Trongle X4 is also one of the smallest set-top boxes that we've seen. Wi-Fi is built in, but the X4 couldn't see our 5GHz 802.11ac network, so could only connect via 2.4GHz. The connection was painfully slow, so we recommend using the Ethernet connection at the back instead. As the X4 runs full Android 6.0, the Google Play Store is built in, making it straightforward to install Kodi (or other Android apps). As the play store is designed for touch, navigating it with a remote control is a little painful. It's handy that the remote has a Mouse button, so you can move an on-screen pointer to make selection a little easier, though. Once installed, Kodi can be pinned to the front screen, making it easy to launch; the only thing you have to wait for is the X4's 25s boot time, as there's no fast standby mode. The X4's HDMI 2.0b output supports HDR10 and HLG HDR processing, along with Ultra HD resolutions, so you'll easily be able to play the best-looking content on this box. After all of the latest updates had downloaded and installed, Kodi ran smoothly on the X4, quickly connecting to our shared folders. We tested both 1080p and 4K films, with all playing smoothly, thanks to the 2GHz quad-core Amlogic S905X CPU. Buffering becomes an issue over Wi-Fi, but we had no such problems when using Ethernet. There's even a microSD card slot (up to 32GB), so you can store content locally and carry the X4 around with you, making it great for holidays. The Amazon Fire TV and Nvidia Shield are slicker for 4K, but this is a good budget option. The Raspberry Pi 3 is a brilliant little computer for all types of projects, and its diminutive size makes it an attractive option for building a tiny Kodi media centre. The Raspberry Pi Foundation makes this easy, too, with NOOBS supporting two pre-built options: LibreELEC and OSMC. We've used OSMC for this guide. Once installed, the Pi 3 boots into OSMC and runs you through a quick configuration wizard before moving to Kodi. After that, the Raspberry Pi 3 takes around 20s to power on. OSMC gives you a custom skin designed for the Pi, although you can switch back to the Classic option. We recommend avoiding over-complicated skins, as the Pi may struggle to run them. As it stands, the default skins work well, but the animations are only just on the right side of smooth. It's also worth buying a fast microSD card so that the Pi 3 boots quickly and remains responsive. Thanks to its quad-core CPU, we found that that the Raspberry Pi 3 could handle 1080p videos easily. There's no Ultra HD support from the HDMI output, and the Pi 3 can't downscale 4K movies. With our test 4K footage, the Pi showed a broken image and became very jerky to use. Given the 802.11n Wi-Fi built into the Pi 3, you may find that you need to use the wired Ethernet connection if your wireless network signal isn't strong enough and you get buffering issues. The Pi 3 comes without a case, so you'll need to budget for one. It doesn't ship with a remote, either, although you may be able to control Kodi using an HDMI CEC-compatible TV's remote; the smartphone app is otherwise the easiest method. If you have a Raspberry Pi 3 already, it will make a decent 1080p Kodi media centre. If you don't have one, the Amazon Fire TV Stick is a better choice, and cheaper considering it comes with a remote and doesn't need a case. The Emtec GEM Box might seem like a good choice for Kodi, but we'd only recommend it if you've already got the box itself lying around. Running Android 4.4, the GEM Box is not compatible with the latest builds of Kodi, and the Google Play Store doesn't show the software as available for download. Instead, you have to install the Complete Kodi Setup Wizard, which gives you access to older versions of the software. From here, we could install Kodi 15.2 Isengard instead. It's fiddly using to Google Play Store to install the Setup Wizard, and we had to flick the switch at the bottom of the game controller to move between normal and mouse mode in order to select the search box and installation options. Kodi 15.2 ran smoothly enough on our GEM Box, and we soon had it set up to stream content. Full HD content played without trouble. The GEM Box doesn't have a 4K output, nor can it downsample 4K video; our Ultra HD video just crashed the media player, and we had to cycle the power. Struggling with larger video files shows that the quad-core processor is a little behind the times. 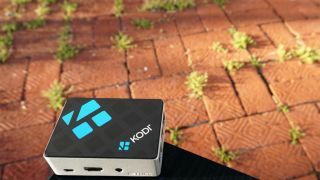 The PC is the most versatile platform on Earth, so why not use it to build your very own Kodi box? Yes, the total cost will outstrip that of the other models here, but you'll get a more powerful unit that can run more than just Kodi. There are lots of options to go for, too. The simplest is to buy a pre-made mini PC. We tested on the excellent, but not widely available, Asus VivoMini VC65. This tiny computer measures 197 x 196 x 62mm, so will easily squeeze underneath your TV. There's even a version with a built-in DVD drive, too. The other option is to build your own computer - check out our guide on how to build a console-sized gaming PC for a good guide. The benefit of the second option is that you can specify the exact PC you want, so that it can even play the latest games. There are a few things to watch out for. First, integrated graphics on Intel processors only support an HDMI 1.4 output. That means you're restricted to 4K at a jerky 24Hz; you have to use DisplayPort to get the full 60Hz in Ultra HD. For that reason, you will need a mini PC with a dedicated graphics card that has an HDMI 2.0 output. You don't get a dedicated remote control with most PCs, but the control options are huge: you can use a wireless keyboard, game controller or the smartphone app, amongst others.